Television is something that has always interested me. My name is Safiya Pomell and my journey into the industry started in 2012 when I joined a specialist school on the broadcasting strand at the age of 15. Being apart of Television and Broadcasting at the University of Portsmouth has really helped me improve on my skills, from my general work ethic to knowledge and professionalism. I succeeded in landing a CCITV managerial role as the marketing manager. 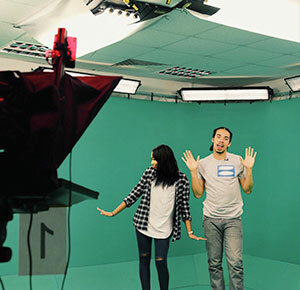 The Creative Cultural Industries TV channel is our specially designed platform to allow the emulation of professional practice and it is run by third year students who produce live TV each week! Tackling the role of marketing manager was always going to be a big challenge. It was a role I was excited to throw myself into and explore further as marketing, advertising and social interaction is something that intrigues me. Marketing in TV is a key element to the success of a channel. If there is no marketing you run the risk of having no audience. No audience means that all the hard work put in by the producers and directors would be done in vain! So it is key I raise awareness of the channel so people know it is there producing live television content every week. Starting the third year was important for me to mark out what milestones are needed in order to tackle my role for this year successfully. Marketing can be a long process, it takes time, so planning ahead and good strategies are vital. Knowing what the audience wants to see is very important. Over the summer I did a placement at Wall to Wall Media. A production company based in London. I worked on programmes such BBC Ones Who Do You Think You Are? And ITV1s Long Lost Family as a junior researcher where I carried out detailed factual research. I also helped research for a follow up series to BBC Twos popular family-based show Back in Time for Dinner, to develop an exciting new ten-part science series for the National Geographic Channel about chemistry. All of this was crucial for me going into my role as CCITV marketing manager. I was able to see why research is key, as well as finding out what exactly it is that makes an audience keep watching. I also went to the BBC broadcasting house and spoke with Carla Maria-lawson who is the commissioning editor for daytime and early peak shows on the BBC. She gave me a wonderful insight into what you look for when planning and learning what approach to take for your target audience. I am still in the process of learning as my role develops and I am excited to see where the channel will be by the end of next year. For now I am going to continue working on pushing CCI TV forward with my recently gained experience,so hey, why dont you check it out! So now seems like a good time to introduce myself - Im Aislinn Fadian and I manage the Social Networking for the CCI TV Channel. It's my job to publicise this channel via social media, making sure we are hitting weekly audience targets, increasing viewers and generally gaining exposure across the social media board. Social networking isnt just about hitting those targets for this channel, its also about engaging viewers, and keeping them hooked. I have learned that its not only text thats important on Social Media. Photos and videos send a great message catching the publics eye. So using many techniques, I can present a different side to the channel. As an experiment I decided to capture behind the scenes photos and post across the platforms - it gave our followers an insight which was normally reserved for those producing the shows, and I think it's worked well so-far. And this is why I love my job, because the course I am on allows me to experiment and really explore what the actual job feels like to do, being able to experiment with all kinds of concepts within the channel using the power of social media. Without the use of many platforms such as Facebook and Twitter, we would be limited in how we publicise our TV programmes. and the content and much of our work would subsequently go unnoticed. But it is also important for audience interaction, enabling our viewers to be involved and participate in live debates, game shows and many more. Our most interactive moment so-far this year has been the use of the Universitys bespoke interactive system entitled - allthevotes. We were able to use this platform to host an interactive quiz, and students were able to give their answers via their mobile phones. It was brilliant!! On a good week our social media ripple can engage as many as 3000 to 4000 people! There have been a few times that what we have done has gone viral creating an engaged audience of up to 32,000! Ive not hit those heights yet, but I will in good time. Upon graduating next year Ill be able to put my knowledge to good use within the industry, but for now as my manager role still develops, I hope to come up with plenty of ideas for the channel which I hope will make a massive impact.